REFINED SUSPENSIONS: The new Panigale V4 is equipped with a 43 mm diameter Showa Big Piston Fork (BPF) that is fully adjustable in the compression and extension of the hydraulic brake and in the spring preload. The fork sleeve seats chromed legs to which Brembo radial brake calipers are attached. The front package is completed by the Sachs steering damper. On the back there is a fully adjustable Sachs shock absorber that on one side is attached to the Desmosedici Stradale with forged aluminum. 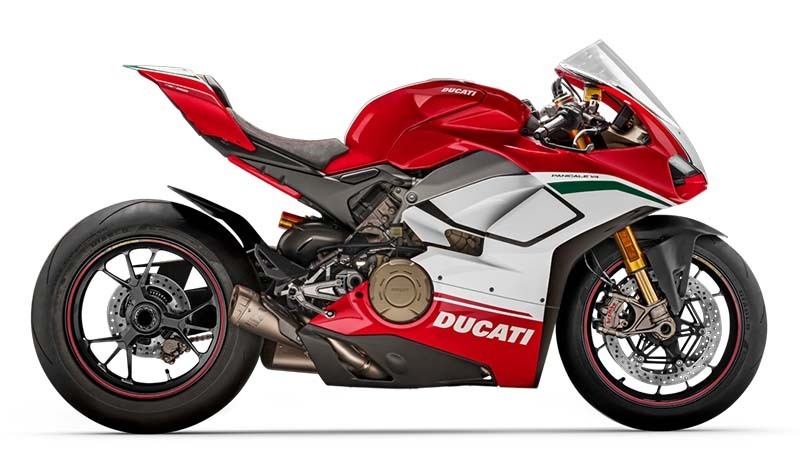 The new Panigale V4 S and Panigale V4 Speciale are equipped with an Öhlins NIX-30 fork, Öhlins TTX36 rear shock absorber and Öhlins steering damper with event-based control system. On these versions, the suspension and the steering damper are controlled by the second-generation control system, Öhlins Smart EC 2.0, featuring, among other things, the new Objective Based Tuning Interface (OBTi). DESMODROMIC SYSTEM: On the Desmosedici Stradale the design of the desmodromic system is a key factor for obtaining top performance. The Desmodromic system in the Desmosedici Stradale uses components that have been completely redesigned and miniaturized to obtain very compact heads, achieving a level of sophistication, compactness and lightness never seen before on a Ducati bike. Each component of the system was designed and tested to safely reach the rotation speeds the V4 is capable of achieving. Also contributing to the compact engine heads are the new spark plugs, smaller than the standard model currently in production. The four camshafts of the Desmosedici Stradale engine move the 16 steel valves, the intake valves having a diameter of 1.34 in. (34 mm) and the exhaust valves measuring 1.08 in. (27.5 mm) in diameter, quite large in relation to the 3.18 in. (81 mm) bore adopted. The valve seats are made of sintered steel. Given the V4's high rotation speeds and the large size of the valves, the latter could not follow the cam closure profiles using a traditional spring system. This is why the Desmodromic system becomes indispensable. In Ducati's ""Desmo"" the valves are mechanically closed with an accuracy similar to that of the opening phase, making it possible to realize more pronounced cam profiles and extreme timing that optimize the dynamic flow of fluids both during intake and exhaust and therefore greater performance of the engine. The camshafts are controlled by two “silent” timing chains. On the front timing system the chain drives the intake camshaft, which in turn transmits motion to the exhaust via a pair of gear wheels (mixed chain-gear timing system). On the rear timing system, on the other hand, the chain drives the exhaust shaft which transmits motion to the intake line. This choice minimizes timing absorption, benefiting performance and reliability. The chain that controls the timing of the front cylinders is positioned on the right side of the engine and is driven by the crankshaft through a gear on the sprocket of the primary transmission. The one that drives the rear cylinders is situated on the left side of the engine and is driven by a gear that is part of the crankshaft. Each head has an ""anti-beat"" sensor that makes it possible to optimize the management of advance firing, avoiding knocking phenomena. Front - 3-spokes forged magnesium alloy 3.5 x 17 in. Rear - 5 spoke light alloy 6 x 17 in.